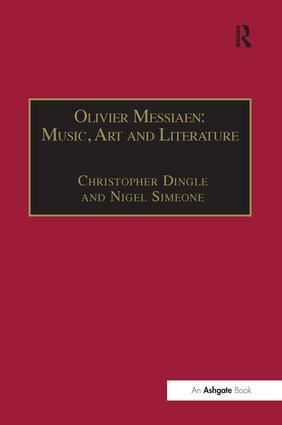 When Olivier Messiaen died in 1992, the prevailing image was of a man apart; a deeply religious man whose only sources of inspiration were God and Nature and a composer whose music progressed along an entirely individual path, artistically impervious to contemporaneous events and the whims both of his contemporaries and the critics. Whilst such a view contains a large element of truth, the past ten years has seen an explosion of interest in the composer, and the work of a diverse range of scholars has painted a much richer, more complex picture of Messiaen. This volume presents some of the fruits of this research for the first time, concentrating on three broad, interrelated areas: Messiaen's relationship with fellow artists; key developments in the composer's musical language and technique; and his influences, both sacred and secular. The volume assesses Messiaen's position as a creative artist of the twentieth century in the light of the latest research. In the process, it identifies some of the key myths, confusions and exaggerations surrounding the composer which often mask equally remarkable truths. In attempting to reveal some of those truths, the essays elucidate a little of the mystery surrounding Messiaen as a man, an artist, a believer and a musician. Specifically, the volume covers Messiaen's attitudes and associations to Cocteau, Stravinsky's Les Noces, Dutilleux and Toesca, as well as exploring his teaching techniques, the Traité de rythme, de couleur et d'ornithologie, Messiaen's harmony, performing and transcription techniques, composing for Ondes Martenot, his association with ballet, Saint FranÃ§ois d'Assise and the influence of his faith. Messiaen himself contributes directly in the form of a speech that he gave about the tapestry-maker Jean LurÃ§at, and the collection also includes the first literary translation of L'Ã¢me en bourgeon; the garland of poems written by Messiaen's mother, Cécile Sauvage, when she was expecting him. The composer described these poems as 'the only influence' in his life, making L'Ã¢me en bourgeon a fascinating centrepiece to a rich and rewarding collection of essays. Contents: Editors' note; Introduction; Messiaen and Cocteau, Stephen Broad; L'Harmonie de l'Univers: Maurice Toesca and the genesis of Vingt Regards sur l'Enfant-Jésus, Edward Forman; Messiaen and Dutilleux, Caroline Potter; Les Noces and Trois Petites Liturgies: an assessment of Stravinsky's influence on Messiaen, Matthew Schellhorn; From FÃªte des Belles Eaux to Saint FranÃ§ois d'Assise: the evolution of the writing for Ondes Martenot in the music of Olivier Messiaen, Jacques Tchamkerten; Messiaen recorded: Quatre études de rythme, Peter Hill; Messiaen's chords, Allen Forte; The record of realism in Messiaen's bird style, Robert Fallon; Musical analysis according to Messiaen: a critical view of a most original approach, Jean Boivin; Messiaen - bibliophile, Gareth Healey; Observations on time in Olivier Messiaen's Traité, Andrew D.J. Shenton; L'Ã‚me en bourgeon, Cécile Sauvage (translation and afterword by Philip Weller); The life and works of Jean LurÃ§at, (1892-1966) Olivier Messiaen; Dancing TurangalÃ®la: Messiaen and the ballet, Nigel Simeone; Frescoes and legends: the sources and background of Saint FranÃ§ois d'Assise, Christopher Dingle; The music of Olivier Messiaen and the Catholic liturgy, Père Jean-Rodolphe Kars; Bibliography; Index. Christopher Dingle is Assistant Course Director at the Birmingham Conservatoire, UK. Nigel Simeone is Professor of Historical Musicology in the Music Department at the University of Sheffield, UK.